Kimchi is made of Chinese cabbage with a variety of different spices and is allowed to slightly ferment. The flavour of Kimchi is intensely chilli, slightly salt and the fermentation adds a tangy vinegar taste. Although it is wonderful with a bowl of rice, many Koreans enjoy using older Kimchi as an ingredient of stews, noodles, Kimbap (California roll) and pancakes (Jeon).Kimchi Jeon is the most popular Anju (which we all know by now means the type of side dish that accompanies alcoholic beverages) in Korea. Kimchi pancake is made primarily with sliced Kimchi mixed with batter. 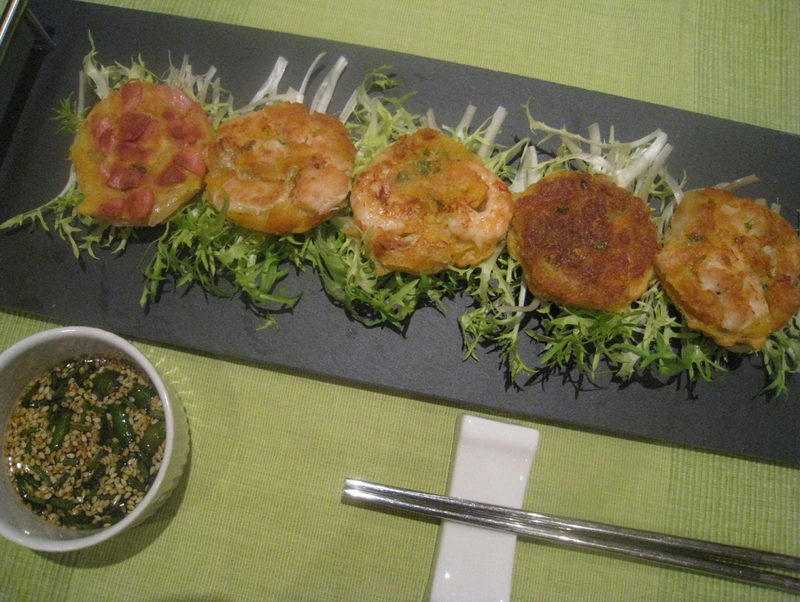 However, many small Korean cafes are eager to create their own signature dishes so they often add some other ingredients such as seasoned pork, squid, prawns or some other seafood with kimchi in their pancakes.Koreans tend to eat kimchi pancake with a light soy dipping sauce.I mixed two different types of commercial flour which are already seasoned. In Korean “garu” means starch flour. “Buchim garu” is mixed starch flour for pan frying and “Teakim garu” is starch flour for deep frying. I mix both together since I find it makes for a more crispy result. You can buy these types of flour from a Korean supermarket or you can use my mixed flour recipe. For my Kimchi pancakes I’m going to use a choice of additional ingredients, in this case some chicken breast, some sausage, some prawns, some tuna and some squid with onions. You are welcome to try others and please tell me how it goes! Coarsely chop some chicken breast, prawns, squid, onions and sausages and put seperately aside. Drain and breakup the tuna.Drain any excess liquid from the Kimchi and chop it up, if the pieces of kimchi (or other ingredients are to large then it can be difficult to eat gracefully.Finely chop some red or green chillies which we’ll use as added seasoning if desired.Mix cold water, an egg with the Teakim flour and Buchum flour and then stir them untill any lumps have disappeared. Put the kimchi into the batter mix and stir well. Use plenty of olive oil in a frying pan on a low heat.Scoop a spoonful of kimchi and batter into the frying pan and then the additional ingredients you like on top.You can sprinkle a tiny bit of fresh chopped chilli on top if you want. Change the heat to medium low and turn the pancakes over frequently until the colour of both sides is golden and crispy.You can trim the pancakes with a pastry mold if you want an eye catching appearance for your guests.For the soy dipping sauce, mix well soy sauce, lemon, sesame oil, honey, toasted sesame seeds, black pepper, garlic, chives and fresh chillies (optional).